These small nested gift boxes will add a decorative touch for Wedding table or party centerpieces. They are versatile enough to also be used for gourmet candy sets or small gifts. 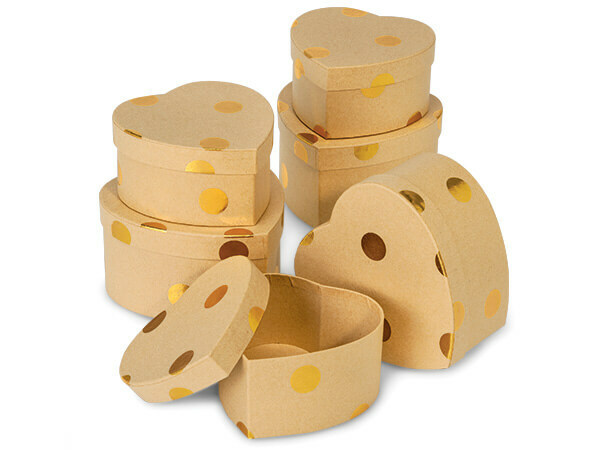 These sturdy cardboard boxes with lids are covered in a brown kraft paper with a metallic gold or metallic red hot-stamped polka dot. The 3 sets contain a small and medium box. The small box is nested inside the larger one, for a total of 6 boxes!